Update: Found a more detailed article in English. 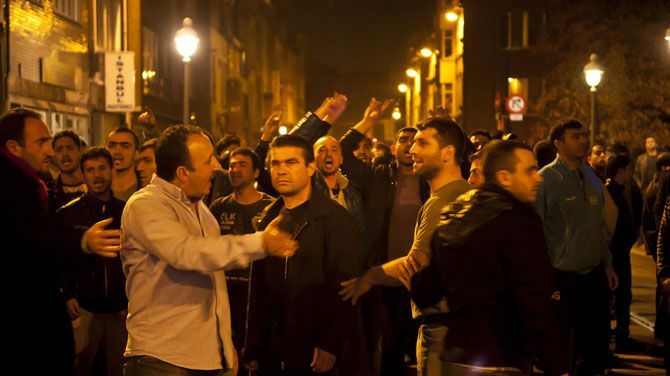 The northern port city of Antwerp was the scene of rioting between Kurds and Turks on Saturday night. The incidents were focused around the Van Kerckhovenstraat where members of the city’s Kurdish and Turkish communities clashed. Saturday's riot was the third incident between Kurds and Turks in only a week's time. It was around 10 PM that Antwerp police received the first reports of a brawl out on the street. Within minutes the belligerents were joined by several hundred members of the two communities. It was especially young people who joined in the fracas. A massive police presence attended the scene. Police officers did their best to separate the two groups and prevent further fighting. At one point the rioters hurled street paving stones at the police that responded with tear gas. Calm returned around 1:30 AM.